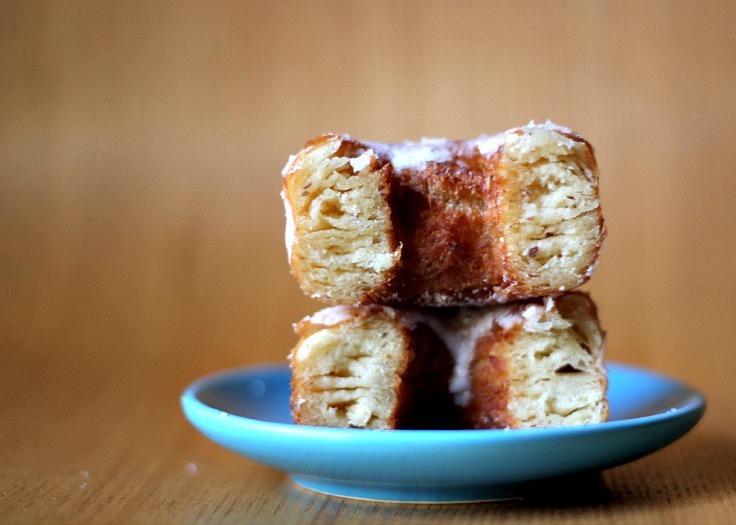 When I first heard about Cronuts I was obviously intrigued. As a fan of eating, I felt like I needed to do something with this concept. 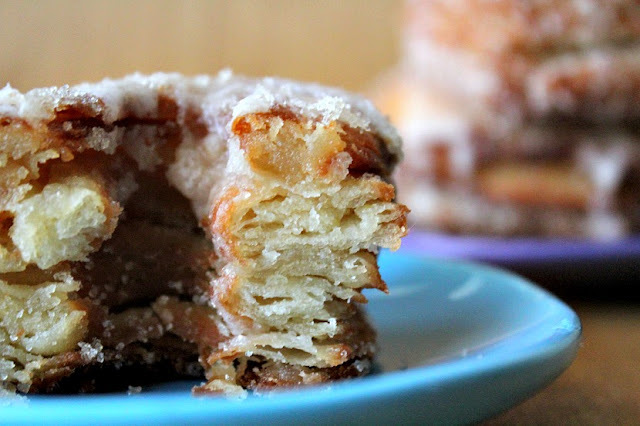 Knowing that the Cronut is made with specially designed dough that is both donut and croissant, I took my favorite soft yeast dough (as seen in my King Cake) and treated it like puff pastry. The result was fascinating and delicious! The puff pastry method creates layers of flakiness that are a pleasure to eat. 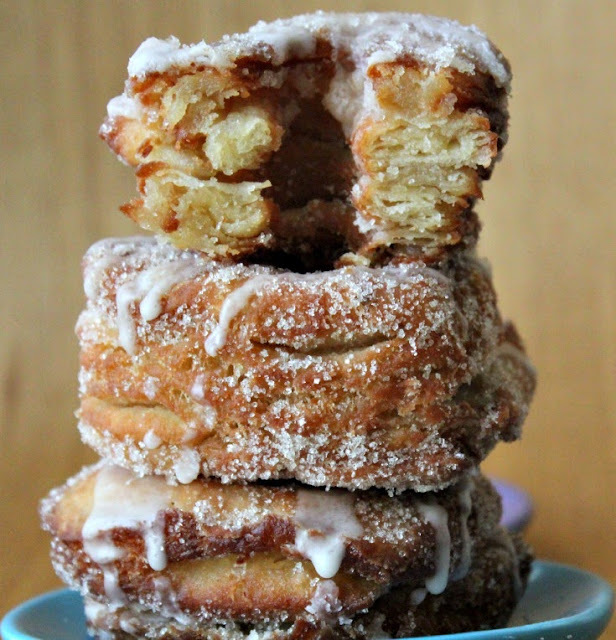 The real Cronut takes three days to make and is fried in Grapeseed oil at a very specific temperature before being filled with cream and topped with sugar and glaze. So while these aren't the real deal they are rather exquisite. Maybe one day I'll have time to go full force with the cream filling, but for now I wanted to get a feel for the basic pastry. These are just coated with sugar and a basic glaze. They are perfect. 1. Place your first cup of Earth Balance between layers of plastic wrap and use a rolling pin to roll to a medium sized rectangle that is about an inch thick. Place in the refrigerator to harden. 2. Scald the non-dairy milk. Remove from the heat and stir in the Earth Balance. Set this aside. 3. In a large bowl, dissolve the yeast in the hot water. Let this sit for a about 10 minutes. While the yeast is sitting, whisk together the ground flax seeds and 3 tablespoons of water. 4. When the yeast is bubbly, stir in the milk and Earth Balance, the flax seed/water mixture, sugar and salt. Stir the flour in 1 cup at a time. When the dough has pulled together, turn it out onto a lightly floured surface and knead until smooth and elastic. 5. Place the dough in a bowl, cover with a cloth and let this rise for 2 hours, until doubled. 6. Roll the dough to a large rectangle at 1/4" thick. Place the refrigerated Earth Balance in the center of the dough and fold the excess dough over the Earth Balance to cover it. Turn the dough seam down and roll into a rectangle that is 1/4 inch thick. Fold the dough into thirds (like a letter), making sure the edges line up. Wrap the dough in plastic wrap let it chill in the fridge for 30 minutes. If your fridge doesn't get cold enough, you can put it in the freezer for 20-30 minutes. 7. Remove the dough from the fridge and roll it into another rectangle making sure the longest edge of the rectangle is towards you. Fold it into thirds again from left to right. Place back in the fridge to chill for 30 minutes. Repeat the rolling and folding 3 more times. 8. Roll the dough out to 1" - 1.5" thick. Cut out your shapes(I used the standard donut shape) and place them in the fridge for 30 minutes. 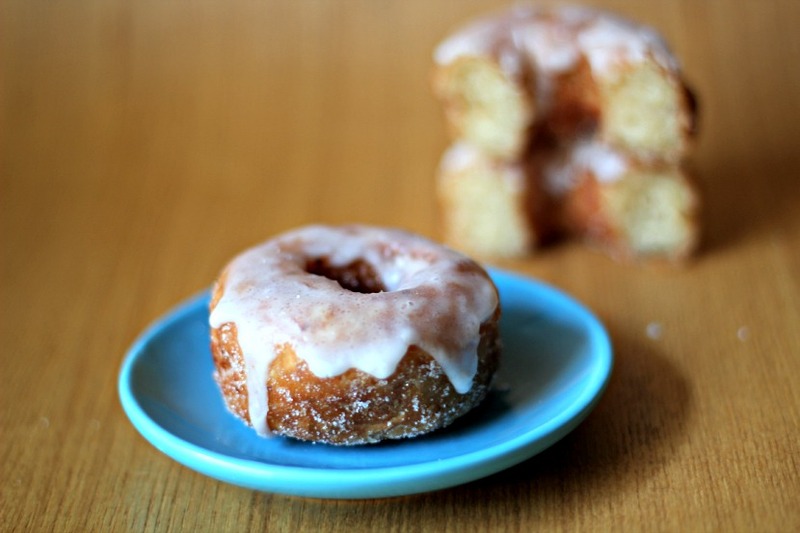 While the cronuts are chilling place a cooling rack over a paper bag or paper towels on your counter. 9. Heat your oil over medium heat to 350-360 degrees. Fry the cro-nots until they are deep golden brown. Remove them from the oil and drain them on the cooling rack. Be very careful removing them, as they are flaky and come apart very easily. 10. 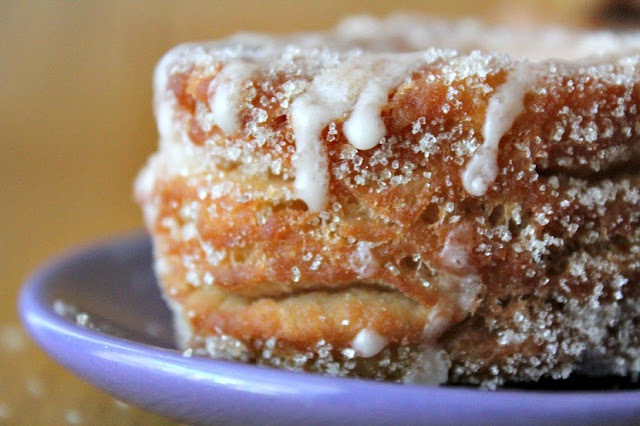 After the pastries have cooled, roll them in sugar and top with your favorite glaze. Eat right away! Refrigerating overnight is not even almost recommended.